Layers of ethereal lace combine to create this wedding gown of uncommon beauty. 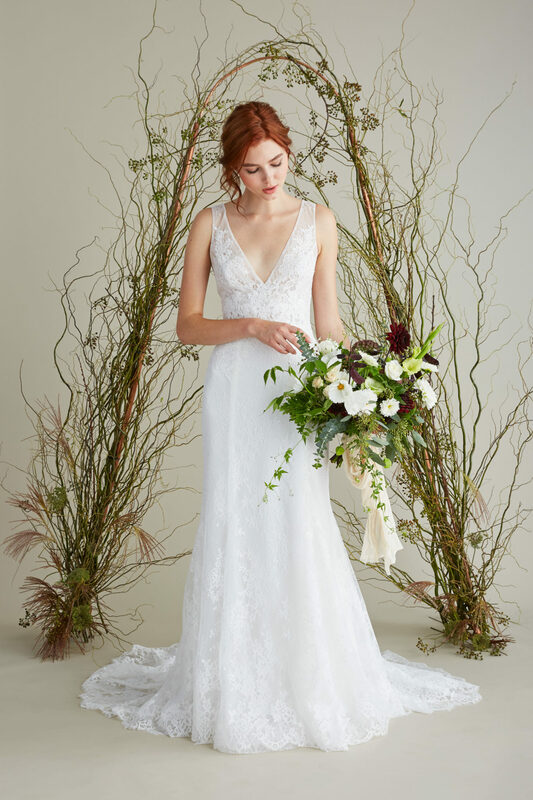 Draped in fine Chantilly laces, thoughtfully placed hand-cut Alençon lace appliqué adds breathtaking dimension at Simone’s sheer V-neckline and waist. Her fitted bodice and hip fall into a splendid fluted skirt with full lace train. Shown in off-white. Details: Fluted Chantilly lace gown with hand-placed Alençon lace appliqué at the sheer V-neckline and waist. Gored skirt falls into a full train. Button and loop closure. Handmade in Canada of 100% silk.